I was thinking its been a really long time I have not tried a chocolate recipe as I was using more of fruits and other stuff in my baking. I have tried a lot of recipes of which I have posted the pictures on my FB page but somehow couldn't post the recipe here on the blog. Something or the other just kept me away from writing the recipe and posting it on the blog lately. I promise all of these would get archived on the blog by end of next week. I am keeping my fingers crossed. The day has been very packed for me as I was in the kitchen all day baking some homemade granola muffins to participate in a healthy cooking competition at the Golds Gym being hosted. I was excited about my first ever participation in any cookery competition. I didn't win, but enjoyed just being a part of it. Once I came back from the competition, Mr. SD was waiting for me to go to the Volkswagen showroom to test drive the new car he finalised for us. By the time we came back from home, it was already 7 in the evening and I was completely exhausted. And that's when Mr. SD tells me that we would be leaving in precisely an hour for his friend's birthday dinner and wondered if I can make "something" for the birthday boy. I realised cake was not an option considering the amount of time I had. I thought of something boozy as it was going to be an all adults dinner and something chocolate as that is the choice of anybody for a birthday no matter what the age. Hence, I thought of Rum and Raisin Brownies as it takes no time to whip up everything and much less time to bake and once baked you are done. I was good to go...Exactly what I wanted at the occasion. And for this, I completely involved Mr. SD to whip things up. (Yes, he is very supportive of me...Lucky me!!!) I started off by melting butter, chocolate and brown sugar in the microwave...less than a couple of minutes. While Mr. SD was breaking the eggs and whisking them up with some caster sugar I added the melted chocolate butter mixture while continuing to whisk the eggs. I then got the bottle of rum and measured it to half a cup while Mr. SD was staring at the quantity of rum I was adding to the mixture. I know, it was in excess, but that's exactly what was required to make these brownies decadent and full of flavour! 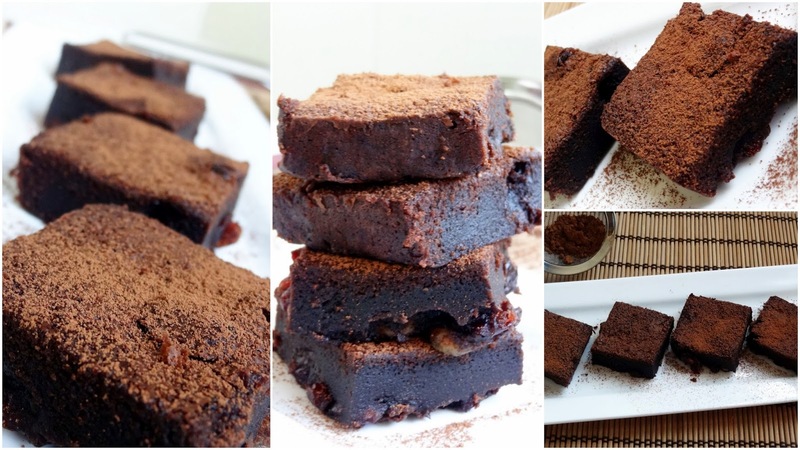 These brownies were packed with the flavours and all the main ingredients i.e. chocolate, rum and raisins mingled so well with each other giving it a great dark dense taste and a gooey fudgy texture. I made 24 brownies and took half of them over to the dinner of 7 and was surprised to see that everybody took 2 helpings of the brownies and all of it was over even before we finished the dinner. Preheat your oven to 350 F /180 C. Line a 9X13 inch baking pan with some parchment paper hanging out on the sides so that you can pull out the brownies very easily once they are baked. In a bowl, add all purpose flour, salt and raisins or cranberries and whisk it to mix it all together. The reason we are adding raisins in the flour is to get raisins properly quoted in flour so that they don't sink in the bottom of the pan while baking. In a microwave or on a double boiler, add dark chocolate, butter and brown sugar and melt it until nice and smooth. Stir it continuously after every 20 seconds. In another bowl, whisk all the eggs with caster sugar until eggs become pale in colour. Do not over mix the batter as we don't want a cakey brownies. Mix just until the ingredients are combined nicely. Add the chocolate mixture to the egg mixture while continuing to whisk the egg mixture. Add the rum to the chocolate mixture and whisk until combined. It will be a very runny mixture at this in time. Add the flour mixture and mix it well using a plastic spatula or a wooden spoon just until all the flour are combined in the wet ingredient and you don't see any flour in the mixture. Pour the batter into the prepared baking pan and bake for 20-25 minutes or until a tooth pick inserted in the center of the pan comes out clean or with few moist crumbs. Take the pan out of the oven and let it cool on the wire rack for 10 minutes before taking out from the pan. Once cooled enough, take the brownies out from the pan by lifting the parchment paper overhanging on the sides and transfer to the wire rack to cool. Cut the brownies and sprinkle them with some cocoa powder passed through a sieve. Note: we consumed these brownies when these were slightly warm and everybody loved it. You will like them even when cooled I bet. Hope you would also enjoy making this recipe as much as I did. If you like this recipe and if want to be updated with the new recipes updated on the blog, don't forget to subscribe on email or like me on FB or simply post a comment about the blog below.